Clothing/Jewelry Description A black Perkins work shirt, black pants and possibly a gray hooded sweatshirt. Distinguishing Characteristics African-American male. Black hair, brown eyes. Young's stage name is Yung LT. He is trangender; he lives as a male, but he's biologically female. His birth name was Ebony and some accounts refer to him by that name. Young has tattoos of the phrase "Lord's Advocate" on both arms. 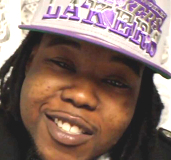 Young was last seen in Milwaukee, Wisconsin on January 1, 2013. His roommate, Billy Griffin, stated a Chevrolet Impala pulled up outside at 10:45 a.m. and Young left their home near north 52nd Street and west Custer Avenue, got in the vehicle and rode away. He has never been heard from again. He was reported missing the next day, after he missed work as well as a scheduled meeting with his mother. Later in January 2013, Griffin and four men were charged with first-degree intentional homicide in Young's case; authorities believe he was the victim of a gang-related homicide. Photographs of the defendants are posted with this case summary: besides Griffin they are Victor Stewart, Ashanti McAlister, Ron Joseph Allen and Devin Lattrez Seaberry. Griffin and Stewart are cousins. Investigators don't believe Young's transgender status has anything to do with the attack, as apparently none of the accused were aware of it. Young's mother found a cellular phone, later traced to McAlister, outside Young's home. Stewart's wife stated he had taken her car out without her permission on January 1 and kept it until 6:00 a.m. on January 2, and when he returned it the car smelled strongly of bleach and there was a bleach bottle inside it. Griffin admitted he'd lied about Young leaving in a vehicle with someone else and stated Seaberry, Allen, Stewart and McAlister came to him and said Young had helped facilitate the burglary of Griffin's home the previous year. They offered to re-admit him into their gang, the Chicago-based Black P. Stones Gang, if he killed Young. Griffin stated the other four men took Young to the basement, taped a plastic bag over his head, choked him with a chain until he lost consciousness, and beat him with tools. Griffin said he went upstairs at this point, but later heard three gunshots. The suspects reportedly cleaned the basement with bleach, rolled Young's body up in a sheet, placed it in Stewart's car and drove it to a trash bin in the 8100 block of north 84th Street, where they dumped it and set it on fire. Investigators found a piece of duct tape with Stewart's fingerprints on it in the basement, as well as eight blood spatters on the basement wall and floor and on a bucket; the blood turned out to be Young's. DNA from the defendants was not found in the basement. In the trash bin Griffin indicated, they found a chain, burned clothing and evidence that someone had set a fire there. Authorities believe Young was shot with a .22 caliber semiautomatic silver handgun owned by Bruce Christopher; the gun has been been located. Christopher denies any knowledge of the Black P. Stones Gang, besides knowing Stewart is a member, and any participation in the homicide. He was not charged in connection with Young's death but did face charges for illegal possession of a firearm. Subsequently, Stewart and Seaberry pleaded guilty to second-degree reckless homicide and were the star witnesses against Griffin and McAlister at their trials. Christopher also testified. McAlister was convicted in June 2013; he was sentenced to life in prison and won't be eligible for parole until 2066. Griffin's trial ended in a hung jury that same month; in February 2014, he pleaded guilty to reduced charges of hiding a corpse, harboring or aiding a felony by falsifying information, and solicitation of substantial battery. He faces up to eight years in prison at sentencing. Also in February 2014, Allen was found guilty of murder and faces life in prison at sentencing. Authorities believe Young's body was taken to a landfill in Menomonee Falls, Wisconsin; they looked for it until mid-February 2013, but found nothing and eventually called off the search effort. Foul play is suspected in his case due to the circumstances involved. Updated 1 time since October 12, 2004. Last updated March 6, 2014; casefile added.